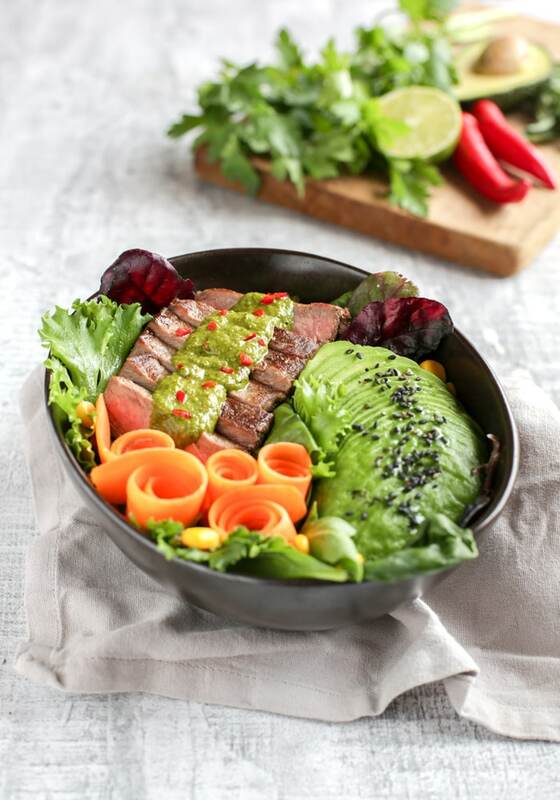 This vibrant Irish Steak Salad Bowl with Chimichurri Sauce is loaded with veggies, high in protein and naturally gluten-free. The perfect meal to enjoy all summer long! For the marinade: whisk together soy sauce, lemon juice, and garlic clove. Place the meat in a zip-lock bag and pour the marinade all over. Close the bag and refrigerate for at least 4 hours. In the meantime, prepare the chimichurri sauce. In a small food processor, add parsley, oregano, garlic, shallot, sea salt and red wine vinegar. Pulse until combined, then slowly pour the olive oil in and pulse until you reach a nice creamy consistency (you may also leave it chunky if you prefer). Remove from the food processor, and mix in the finely chopped chili pepper. Refrigerate until ready to use. Remove the meat from the marinade, pat dry and season with a generous pinch of sea salt on both sides. Place the steak on a hot grill (or cast iron skillet). For medium-rare, cook for 2.5 minutes on each side, turning the meat every minute. Remove the steak from the grill and allow to rest on a hot plate for about 2 minutes, then cut into slices. Whilst the steak cooks, prepare the salad. Peel and finely slice into ribbons the carrot. Peel and finely slice the avocado. To assemble your salad, arrange a bunch of fresh baby salad leaves in a bowl, top with carrot ribbons, sliced avocado, and sweetcorn. Arrange the steak slices in your salad bowl, and top with chimichurri sauce. Serve immediately, with a lime wedge on the side.